After the Cromalin for a particular design had been approved, what we collectors call ‘proof cards’ were produced. These were printed on industrial scale printing presses – and at one time would have existed in large numbers, simply due to the fact that the industrial printing presses would produce a large number of copies in only a few seconds. Proof cards are typically printed on thinner stock than production cards, although they’re still significantly thicker than paper. The printing is normally of a high quality and the cutting/punches are of a high standard, being industrially produced. Proofs are produced in large sheets of mixed characters (a very small number of which still exist today), and are either used by Kenner in sheet form or, more usually, cut down into individual cards. Large die cutting machines would have cut the rounded corners and punch-holes or some sheets may have been hand cut by Kenner for ‘ad-hoc’ use. A number of proofs exist today which have been cut from sheets, either with or without selvage (white border) – it is difficult to track whether these were cut from sheets by collectors over the years or by Kenner in the day. The primary source for the POTF sheets that have shown up, used to cut them in half to make them easier to handle. Contrary to what the name ‘Proof Cards’ suggest, they were rarely used for proofing designs, as this role belonged to Cromalins. 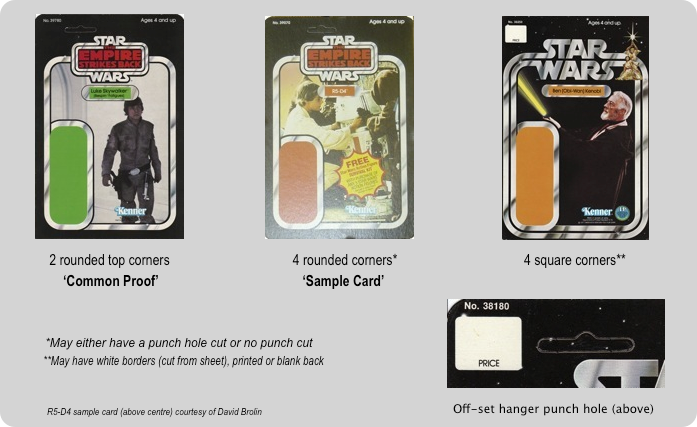 Typical uses for proof cards in the vintage period were product samples, displays for toy fair or to mock-up carded figures for displays and catalogues. Proof cards were also used to conceptualise new designs, often by pasting new logos or new figure photos to the cards prior to any formal design being undertaken. This gave Kenner a quick and cheap approximation of what the packaging may look like. A number Revenge of the Jedi logo mock-ups use Empire Strikes Back proof proof cards, and all Return of the Jedi character paste-ups feature Revenge proofs. To the left is a selection of Return of the Jedi mock-ups which have been produced by pasting copies of character photoart onto Revenge of the Jedi proof cards. It is important to remember that proof cards were working items and are not simply trading cards created 30 years ago for collectors. The condition of proofs will vary and ‘flaws’ such as writing, markings or glue residue may indicate the proof served an important purpose in the packaging creation process, rather than simply being a defaced collectable. 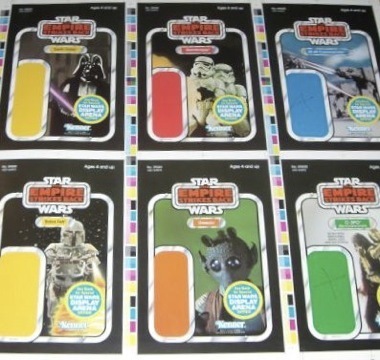 Today few proof cards exist in comparison to the number Kenner would have produced. This is because many examples were used in the production of the toy packaging and those not used were simply thrown aside and, in most cases, destroyed. Those which exist in collections today were either saved from destruction by Kenner employees as mementos or collectables, or some say retrieved from the Kenner dumpsters by several fortunate early collectors. Throughout this website certain proofs may be referred to as ‘one-offs’ or ‘the only known example’ or similar. This designation stems from our own knowledge of the proof cards which have changed hands over the years – as proof cards are effectively mass produced, another example (or more) or a ‘one-off’ card couple can surface at any time; maybe from an underground collector or a new Kenner source. As such any estimations of numbers we make constitutes our best educated guess! Some cards though – the ESB 45, 47, 48 and 48c ‘sample’ style proofs with no printed punch have only ever shown up in quantities of one per character. It’s not known or understood why this is the case. Proof cards exist in several styles, the most common of which is those with square bottom corners, rounded top corners and an offset, elongated (when compared to production cards) punch hole. These have been termed the ‘common’ style of proof cards, given the majority exist in this form. Other proof cards are square and have possibly been manually cut from sheets. Proof cards which have four rounded corners are referred to as ‘Sample Cards. It is not yet known how these fitted into the production process – though at least one Kenner designer has suggested these were approval pieces which were used as a final sample just prior to the actual card’s production run starting – some have shown up with text such as ‘OK’ on them, which may support this claim. Proof cards vary in rarity significantly. There are 50 or more examples of many Revenge Of The Jedi proofs known, however others only exist in quantities of one or two. This can make collecting proof cards especially challenging as invariably the card needed to complete a set or run of a character is a one-off locked away in another person’s collection! Easily the most common proofs are the Revenge of the Jedi 48bk series, while the original Star Wars are the rarest, with around 120 or so examples known for the whole line. Rare card character combination examples exist across all movie series though. Finding a 47bk or 48bk ESB proof may, for example, be a much harder task than finding a 12bk proof, while finding any 4-square corner Star Wars card with a blank back is harder than finding an example of a ESB 31 or 45bk – complicated stuff and difficult to track of! Most of the ‘sample cards’ (with 4 rounded corners) are very rare, with often only one of each figure and card type currently known to exist. 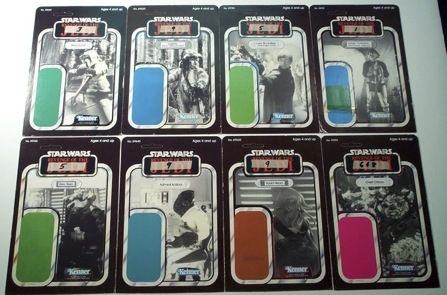 The exception to this rule are those from the Emperor offer ROTJ 65 back series, and some of the production style ‘samples’ – these are cards that appear almost if not exactly identical to production cards (though they no doubt served some purpose, given that several have shown up with text or printing on them. Additional information regarding the rarity of each of the proof card series can be found in each of the proof card sections.